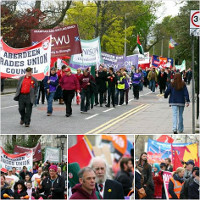 More than five hundred people from trade unions and campaigning groups, including a number of key local politicians and friends of the ATUC, took to the streets and marched along Union Street on Saturday 2nd March to celebrate International Workers’ Day and to call for an end to austerity. Led off by the Guarana Drummers, the march was both colourful and noisy as banners and placards were held aloft and marchers moved to the beat of the drums. Passersby stopped to watch, wave and to take photos, and to show their support for the marchers. Somewhere along the route, the sun came out and the weather stayed fine and Springlike as marchers gathered for an outdoor rally at the Castlegate. Read full article on the ATUC blog.